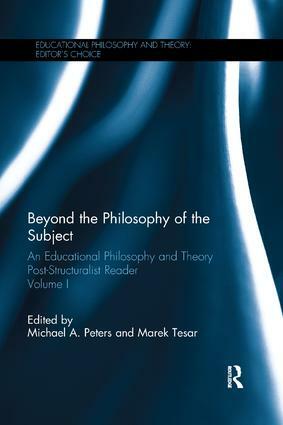 This first volume focuses on a collection of texts from the latter twenty years of Educational Philosophy and Theory, selected for their critical status as turning points or important awakenings in post-structural theory. In the last twenty years, the applications of the postmodern and poststructuralist perspectives have become less mono-focused, less narrowly concerned with technical questions and also less interested in epistemology, and more interested in ethics. This book covers questions of genealogy, ontology, the body and the institution, giving examples of theoretical applications of post-structural theory that testify to the generative and endlessly applicable potential of this work to different fields and avenues of thought. While informed by Foucault’s thinking of the political subjugation of docile bodies to individuals as self-determining beings, the chapters in this book culminate in amalgamations of different schools of educational philosophy, which explore poststructuralist approaches to education. Beyond the Philosophy of the Subject will be key reading for academics, researchers and postgraduate students in the fields of philosophy of education, philosophy, education, educational theory, post-structural theory, the policy and politics of education, and the pedagogy of education. Michael A. Peters is Professor of Education at the University of Waikato, New Zealand and Emeritus Professor in Educational Policy, Organization, and Leadership at the University of Illinois at Urbana–Champaign. He is the executive editor of the journal, Educational Philosophy and Theory. Marek Tesar is a lecturer in Education at The University of Auckland, New Zealand with a focus on philosophy of education and childhood studies. He is a member of the Editorial Board of Educational Philosophy and Theory.